How to Highlight Important Text on Any Web Page you Visit? Sometimes we need to highlight some text in webpage to show important text or point to other friends who are online. Instead of telling everything like see 2nd paragraph, 3rd line..so on like that, it is good to highlight on the webpage itself. But we all know it is not possible to control or modify other webpage without having a login information. 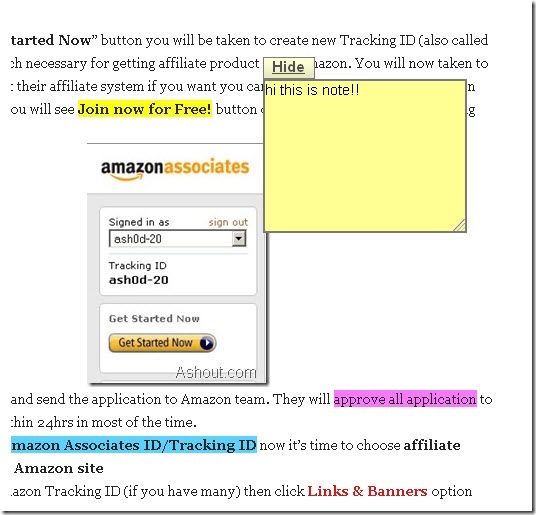 So in this post I will show you how we can easily highlight any webpage with the help of “Awesome Highlighter”. Awesome Highlighter is a free online web apps which help us to easily highlight text and images on any webpage. For using Awesome Highlighter you don’t need to register to their website. They also providing Firefox Add-on and a Bookmarklet to use their website anywhere by simply clicking on it. Now click Done button after completing it. Now they provide you a short URL to visit that highlighted webpage like http://awurl.com/zd2OFf4sX When some visit that page through this link, they will see highlighted text on that page.